If I had a Series 8 Bernina 830 I probably wouldn’t put it out on the front yard like Mrs. Blair did here with her sewing machine. Instead I would move the love seat from in front of the living room window and put it there. I finally understand the why a woman would pose her family with a sewing machine. I could love the 830 that much. It has so many wonderful features. I have been lurking in a few Bernina forums and the reasons some of the ladies have given to justify spending so much on a sewing machine are very creative. Some compared it to their husband’s toys such as motorcycles and boats. One even calculated the compound interest on the cost of a top of the line Bernina thirty years ago. Since I didn’t buy one then, I should have that much in the bank. Right?….. The reasons I could comfortably use justify the expense do not exactly apply to me. One is for business, and the second if I were to make quilts for competition. I think many of the award winning quilts are sewn on this type of machine. It would almost be a necessity to compete. I was thinking if I did have one in my living room maybe I could rent out time on it to other seamstresses like me who want to play on it, but also do other crafts. That was one thought going through my head after viewing all the wonderful features this machine offers people who like to sew. # 1 Dual Feed. It isn’t a walking foot instead the pressure foot actually feeds the fabric through just like the feed dogs. It would be great for slinky fabrics. Those always seem to take forever to sew because of the concentration needed to keep the seam from stretching out. It would be nice to have the extra help. #2 BSR. The Bernina stitch regulator. Keeps stitches even during free-motion sewing. This is another robotic type feature that uses sensors to gain stitch control. Wow, even stitches moving the fabric around in any direction and at any speed. #4 360 Degree Sewing. The machine will stitch in any direction in 1 degree increments. Perfect when it would be hard to turn a bulky item. I can think of multiple times when it would have been so great to just be able to sew at a slight angle because the fabric just didn’t want to move the way I wanted it to. #5 Auto Bobbin Winder. I know other machines have this. My Elna doesn’t and I miss it from my days sewing on industrial machines. #6 Tassels. There is a stitch that makes little tassels on the edge of the fabric. It is so cute. There are also embroidered tassels that would oh-so-chic adorning my holiday table linen. #7 All the other stuff I haven’t mentioned. There is so much more, I could go on and on. 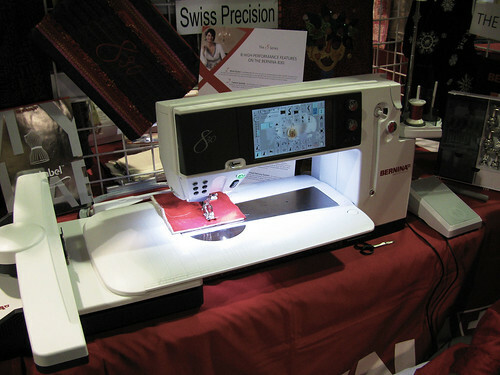 As I mentioned yesterday the price for the Bernina 830 at the quilt festival was $10,000. Well, the festival special was a full size quilting frame to go with it for a mere $2,000 more. I think that would look nice where the sofa is, don’t you? This entry was posted on Wednesday, July 29th, 2009 at 3:00 am and is filed under Sewing. Tagged: Sewing. You can feed this entry. You can leave a response, or trackback from your own site. That photo is a classic! 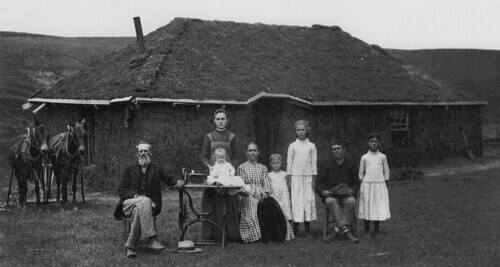 I’ve seen photos where the family had hauled the piano out to the yard for a group portrait. I have a page called “A Word About Bernina” on my blog. I hope you don’t mind if I link to this post from there. I like to gather good info from Bernina fans from all over and put it one place.